Tangled and True: job chart. The girls are currently interested in helping with dishes, laundry and a few other small cleaning tasks. I'm thinking it may be time to start a job chart. I thought this one looked like a good one, but would love to hear advice, what has worked for you, what hasn't, when you started, how you like it and any other tips you have. 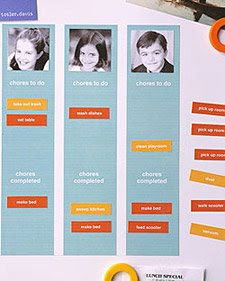 We made this exact chore chart and to be honest it didn't work out so well. It looks great but the slips are really small and hard for small fingers to manipulate and they fall off of the magnet sheet easily. Plus my son is not reading so he had no idea where to put the slips or what they said! Good luck, please share what you decide to do, we are also looking for something. We really need this at my house! I wish I had time to be this crafty! Lately, will all I've got on my plate, I've found that the virtual version works for me. I use a site called Handipoints to do chore charts and it's really been fun so far! i don't have kids old enough to divvy up chores yet, but we did have a system that was written on a dry-erase board weekly (so not as cute as this). we would trade jobs sometimes if we preferred one over another or needed to take a break for the day/week to do something else. of course, your kids would probably have to be willing to compromise with each other. i would probably suggest pictures for kids who can't read. my parents gave us a reward for finishing chores. nothing major but something they knew i really wanted (like getting a necklace i liked at the store), and i was always willing to clean to get a reward. this wasn't a daily reward. it was more of weekly/monthly thing. That is so cute, even if it didn't work I think it's totally darling!